“ For working adults, our online format fits their lifestyle and our workforce focused degree programs resonate with employers and employees alike." Charter Oak State College, Connecticut’s public online college, is accepting applications for its new online Master of Science in Organizational Effectiveness and Leadership. 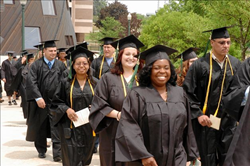 Information and applications can be accessed online at http://www.CharterOak.edu/Masters. The Master of Science in Organizational Effectiveness and Leadership is a 33 credit online degree program with student outcomes including expanding leadership skills, managing change, improving decision making skills, and conducting applied research. The program includes the option to choose one of two tracks – business or non-profit. “Our alums want to pursue higher degrees, and many want to continue their studies at their alma mater Charter Oak State College. For working adults, our online format fits their lifestyle and our workforce focused degree programs resonate with employers and employees alike,” said Ed Klonoski, President, Charter Oak State College. The program is approved by the New England Association of Schools and Colleges (NEASC), the College’s regional accrediting authority. Classes begin this Fall.